Maison Mercer: a multi-experience venue perfect for hosting a variety of events and functions! Maison Mercer stands out as an event location because it is a multi-level spot. Whether you are looking for a performance stage, dance floor, catering kitchen, Mercer offers it all. But what’s is most important for the summer- they have a roof top patio! Being located in Toronto´s Entertainment District, the venue has a great location – just some minutes away from the Bell TIFF Lightbox, Rogers Centre, Metro Convention Centre. Maison Mercer is a 12,000 square foot venue and it can host groups of 250 up to 1300 guests at full capacity. To offer its clients an unforgettable and unified event, they provide state of the art audio and lightning system, video walls. A unique feature is the Maison Terrace, incorporating the South Beach style mixed with classic French European garden features. 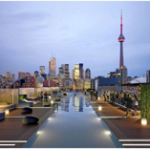 Providing great views of Toronto’s skyline, guests can enjoy the evening sun and enjoy the atmosphere of an urban place that takes you away from the city for a while! With a capacity of 350 persons the space is perfect for events. On Thursday 15th, The Rooftop rendezvous was THE rendezvous not to miss! 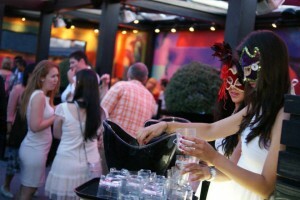 Indeed, The CUBE nightclub hosted more than 400 guests from CityEvents and Shanny in the City for the Rooftop rendezvous! The night was an opportunity to taste a new cider: Tempt Cider, with strawberry and lime flavors, but also to enjoy the presence of artists and an incredible view on the city and the CN Tower. The CUBE nightclub brings you into a parallel world. From the entrance you leave the city and its buildings to enter in a small corridor looking like the path to a secret garden, to be finally guided to a rooftop patio, a true bubble inside the city. CUBE Nightclub is a new Toronto event venue used by a variety of groups. This night was subject to all temptations, from the sweet & fruity cider offer by two masked ladies, to the electrifying music and the lights of the city. Hard not to be entranced by the atmosphere! But, more than temptation, it was also an excellent moment of schmoozing and networking in a pleasant place, and the occasion to get a painting portrait from the artists presents all night. From this incredible night, we only have retained one thing: temptation accomplished! #gettempted. The weather is finally getting warmer and that’s wonderful because winter is Hell. Summer is Heaven. Spring is the beginning of patio season. The beautiful sun draws us outdoors and we feel the urge to explore the city searching for the best patio restaurants in Toronto. Good thing for Torontonians the city has lots to offer in a wide spectrum of venues… too wide actually. From decadent coffee bars and small cafes to dance club smoking sections, finding a great rooftop place to relax with friends can be tough. There are a lot of ingredients needed in the perfect setting; music, service, drinks prices, and location are some important factors that determine the quality of the venue. 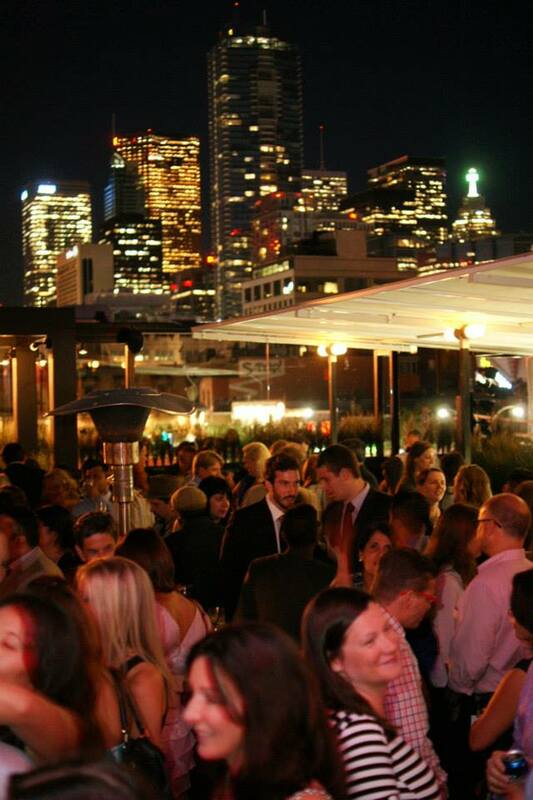 After careful research, here are my top 5 favorite rooftop patio spots Toronto has to offer. The Drake Hotel Sky Yard is the place to be any night of the week. With exceptional service and consistently yummy drinks, the Sky Yard always leaves customers pleased. It’s one of the only places left to smoke cigarettes in public in the entire city of Toronto – that’s why its busy in the winter too and the ‘smoking area’ is still the best place in the whole school to hook up, for smokers. The Sky Yard is a large square open air lounge. It’s a comfortable setting for those looking to loosen up on couches in the sun or small tables in the shade. The Drake hotel is also known for their cool radio advertising and social media campaigns surrounding their events. I once knew a guy who tried to pitch a very comprehensive social media strategy to Bill, the manager and he just laughed and never replied – they get so much free press, it would be like selling ice to an Eskimo. 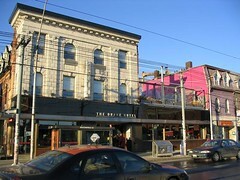 The rooftop patio is located on hip Queen St. W. and often packed with locals on Weds and Thursday and visitors from abroad on Friday and Saturday nights. 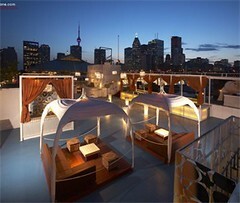 The rooftop patio at Skybar is another must go to location in Toronto. Towering over the waterfront, you will feel as if you are leaving all your worries and troubles on the ground. Check it out and sip on delicious drinks while floating over the city. The décor is draped with beautiful white tents and relaxing cushioned seating. Open only on weekends, this warmly lit patio will have you looking forward to Friday. 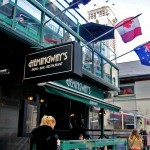 Hemingways is located in the heart of Yorkville shopping district, and is known for their delicious meals and affordable prices. It’s the place to be after a long day at work, which is why it’s hard to find a spot to even stand after 5p.m. This rooftop patio is consistently busy until last call. Make sure to get there early or rush over quick after your workday is over to get a seat. The Spoke Club is another rooftop patio worth visiting, though it is exclusive to members and their friends. There are 3 different sections: A special secluded area that is usually booked for events, a rooftop garden and a glass house patio. The glass house rooftop made of steel and insulated concrete forms is built right on top of a historic building in downtown Toronto and stands out as an interesting juxtaposition that’s open all year. The garden is beautiful and looks well loved. If you can find a friend with a membership or a way to get one for yourself then you are in for a wonderful win. 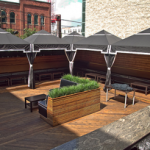 The prize is a beautiful, exclusive rooftop patio for you to enjoy a drink or two. My favourite rooftop patio is Vivoli, at the corner of Grace and College Sts. College is the go-to street for a “hot child in the city” and her friends. 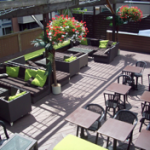 So if you’re a young person looking for a classy place to enjoy the summer breeze then Vivoli’s rooftop patio is perfect. Relax while watching the busy street transform from day to night. Also, their mouth watering Sangria pitchers are recommended. Many of these locations were not built with rooftop patios in mind and several required flat roof repair be done by resurfacing the roof and adding structural supports below. Consequently the management is usually very strict about capacity limits and quite often you’ll notice that dancing on rooftops is not permitted. before ere done to modernize the setting and atmosphere. Rooftop patios are great because they elevate your mood with their location. Because of this, the place and location has to be in its best condition. This rooftop heaven is nestled above Wellington Ave. with a simply breathtaking view of the Toronto lights. The infinity pool, open both day and night, is a wonderful addition that not many patios in the city have to offer. This exclusive retreat offers exceptional service and drinks, and should be experienced at least once. You must be a guest of the hotel, however, or be a guest at a special event located on the patio. However you end up on the patio, it’s worth it! 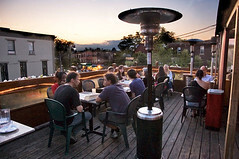 A Toronto staple for many years, the Pilot’s patio, cleverly named the Flight Deck, is one of the town’s best patios because of its unique features. The whole space exudes the theme that is flight, from stainless steel flight craft inspired bathrooms to a carefully executed roof made to look like an airplane from the sky. If you want a unique experience in a unique space, the Flight Deck at the Pilot is the place to go. If you have a fear of heights, overcome your fear and check out this patio. Located on the 51st floor of the Manulife Centre on Bloor St. W., the view gives you both uptown and downtown Toronto. The drink menu is unparalleled in the city and the cocktail menu has won countless awards. In addition, the space itself is intimate, classic and elite. If you’re looking for a night out that you’ve never had, Panorama is an excellent choice. Recently opening up as a new spot in Toronto’s entertainment district, Maison Mercer has become one of the most exclusive spots for events and nightlife in the city. Premiering as an upscale and mature venue, the patio boasts a beautiful crowd with a full bar to cater to all of your drinking needs. Because of its convenient location, Maison Mercer can be your final destination after an evening event in Toronto or your premium location for a night out. You won’t miss with this great patio. For hockey lovers everywhere, Wayne Gretzky’s Restaurant is a home for the star’s personal collection of memorabilia. And if that wasn’t reason enough to visit, perhaps the Oasis Rooftop patio will entice you to take a trip to one of the nicest patios in town. A popular après-work watering hole, you can also look forward to having a beer amongst friends in a beautiful booth overlooking the city after the never-ending 9-5. Get there early, though! This patio is popular and fills up quickly. The King St. W. crowd is one that enjoys an elite clientele, exceptional service, and sought-after DJs. One of the best examples of this is Dolce Social Ballroom. The name of the venue itself suggests a high-class affair, and it’s true. Dolce’s patio is a beautifully designed intimate space that’s just high enough above the streets to experience something exceptional. Open on weekend nights, a trip to the Dolce patio promises to be an incredible summer evening. The Danforth is a haven for those in search of unique and hidden culinary gems. Globe Bistro is one such spot. Named ‘Globe’ because of its unique philosophy to think global but eat local, Globe Bistro offers not only an exceptional menu, but also promotes local events to support local businesses. 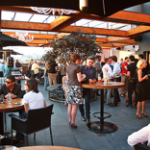 And if that isn’t enough of a reason to have a drink at Globe, how about the fact that the rooftop patio is breathtaking. It’s just far enough away from Downtown, but close enough to escape and experience something new. Open from 5pm daily, the patio features its own menu, complete with over 20 different wines and a huge list of cocktails. So far, we’ve given you a list of downtown rooftop patios that are sure to entice the city dweller. But for those of you on the outskirts of town, Joey at Shops at Don Mills has a great rooftop patio that isn’t too far away. Located right at Don Mills Rd. and Lawrence Ave. E., Joey offers an exclusive experience that you won’t find at the mall or in your suburban neighbourhood. A delectable menu, gorgeous wait staff, perfectly blended cocktails – these are just a few of the things that this rooftop patio has to offer. And what’s great is that you can go for dinner or for a wicked night out with friends. Hopefully this list has given you some great insight into the amazing patios you can check out this summer. If you know of any more, let us know! Have fun!